I feel like a bear waking up from hibernation this month. The weather has been so perfect that I've been spending the majority of my days outdoors. We've already got done a little bike riding, a little road tripping, and a little exploring around Chicago this month. I did get my herbs planted for the summer, and if the weather stays glorious, this weekend I'll be planting the rest of my vegetables and my summer flower bulbs. This is truly my favorite time of the year, and I am already envisioning the upcoming BBQ's with family and friends. 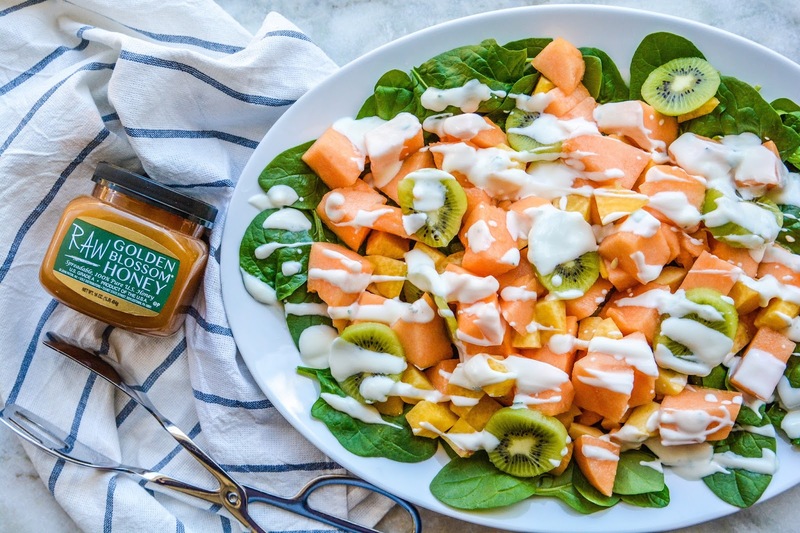 One dish that will for sure be going on our picnic and BBQ menu this year will be this amazing Summer Fruit & Spinach Salad that I snapped up off of Golden Blossom Honey's recipe page. The fun thing about this recipe is you can use any summer fruit and it will taste amazing every single time. The next time I make this, I'll add in more fruits from my garden like strawberries and blueberries, and maybe even a few raspberries or blackberries as well. The dressing pairs well with most fruits, so I don't think there's any wrong combination to toss together on this platter! Have you participated in any summer activities yet this year? Chicago sounds like a whole lot of fun. Will you be planting a bit of spinach too? It is such a robust plant, grows quickly and abundantly almost anywhere and it gives you such pleasure when you can pick it up from your own garden in the summer! I haven't decided on spinach or not yet. I know for sure I am not doing zucchini this year. I have had no luck growing it for the past 2 years. I think maybe brussel sprouts are taking their place this year. I haven't tried those yet. Maybe broccoli too. We'll see. I was a bit miffed when I checked on one of my blueberry plants I put in last year and saw that 1/2 of it was dead :( The other is thriving though, so that makes me happy. Use almond milk in place of the dairy here and you don't get those toxins. Have you tried vegan cheese yet? It's so yum! I probably won't try making my own because cashews and such are so expensive. You will need to find some very good seeds for sprouts and broccoli and give it lots of TLC. I remember I planted sprouts in our old house (which was on extremely fertile soil) and got really excited when the stem grew up massive and giant, but it just would not develop sprouts on it :( I knew you harvest them in very late Autumn almost winter as they are tastiest when the freeze arrives. The same with cauliflower and broccoli, sadly. You could try chard, though right now to have in late summer, it has massive leaves so it's sturdier than spinach. My raspberry is blooming, hope I will have at least a handful of fruit this year. Your blueberry might recover next year, though. They sprout from the root freshly sometimes like my raspberries. What beautiful salad dear Theresa, higs! We're having May birthdays at my house on Mother's Day. Isaak and my nephews Edison and Evan have birthdays. I love making salad like this, refreshing and perfect for the summer! Thanks for the recipe! I eat mostly salads especially during lunch when the weather's warm. I can't wait to make a fruit salad and drizzle some honey! Yummmm! 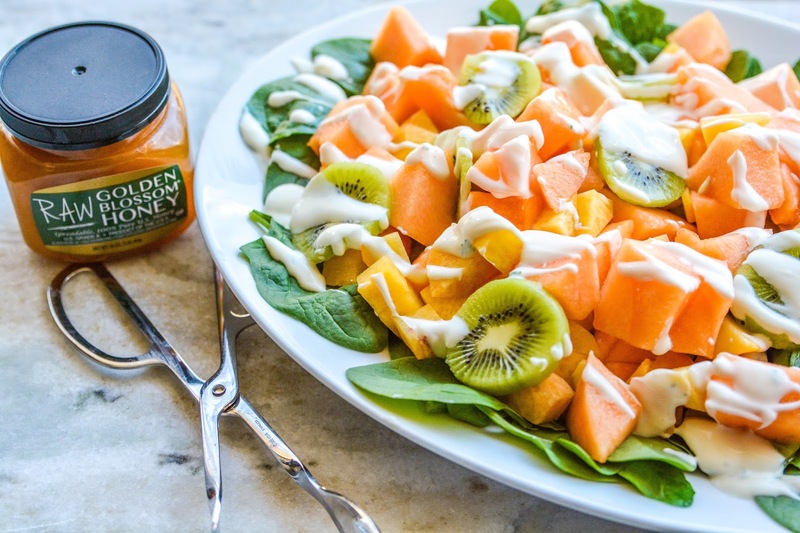 So many great ways to use honey!